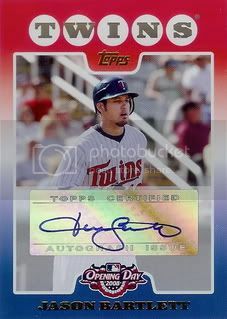 These are probably the nicest certified autos from any of the 08 Topps sets. The Chromes aren't too bad either but I think I like these just a little better. Unfortunately the checklist doesn't really include any big names but on the bright side, we should be able to pick them up at a great price. This Jason Bartlett is the first card from the Opening Day certified autographs set for our collection. 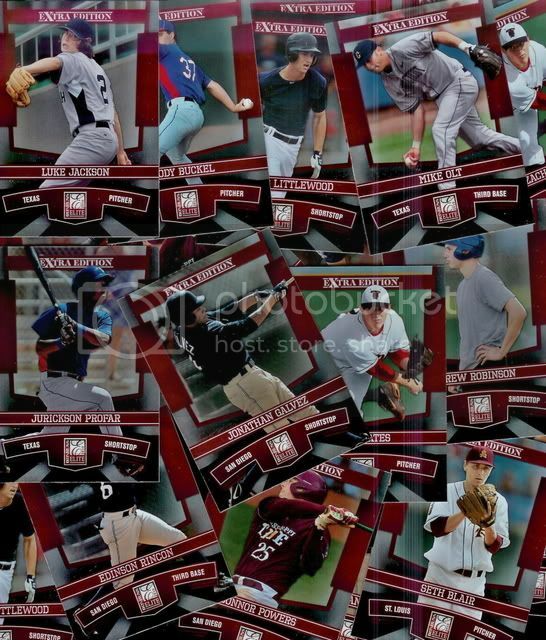 Not excactly Black Friday shopping but I did purchase a complete set of 2010 Donruss Elite Extra Edition this week. 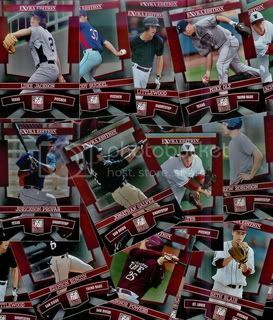 The set includes one hundred cards of this year's top prospects. Not bad for only $10 shipped. Our Black Friday post reminded me that I still hadn't posted the first signed 08 Topps Gold Border Parallel card for our set. 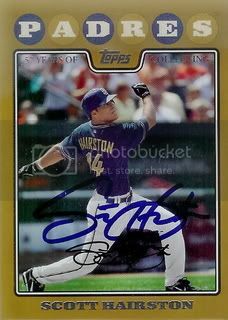 Back in Spring Training, Scott Hairston signed his regular 08 Topps card and his Gold Border Parallel for us. 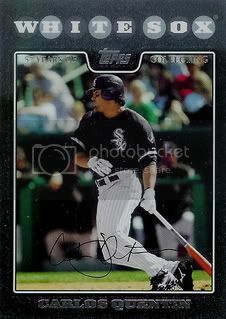 Here at My 2008 Topps Set Blog we're celebrating Black Friday with 2008 Topps Black Border Parallel cards! 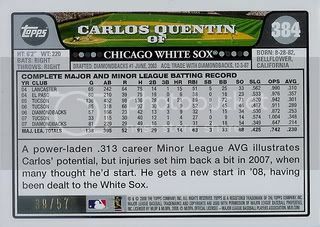 The final card of the day is of Chicago White Sox outfielder, Carlos Quentin. 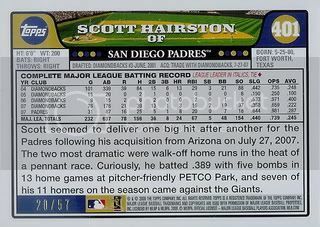 Next is San Diego Padres outfielder, Scott Hairston. 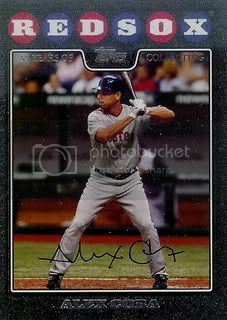 First up is former Boston Red Sox infielder, Alex Cora. 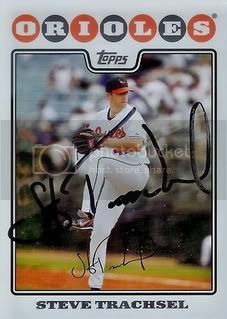 Former Baltimore Orioles pitcher, Steve Trachsel signed a card for our set. I remember Steve's career best from the time he spent with the Chicago Cubs. He was a key component to the 1998 team that won the NL Wild Card. 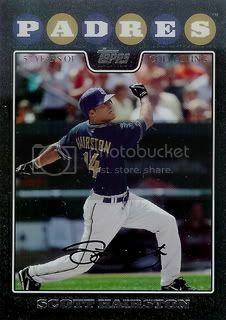 Former Milwaukee Brewers reliever, Salomon Torres signed a card for our set from a recent TTM request. Along with our card, Salomon included some literature about Jehovah's Witnesses. If you'd like to learn more about who they are and what they believe please visit WatchTower.org. Part of the fun of the Arizona Fall League is to see which coaches come to lead the six different teams. Over the past few years Hall of Famers, Ryne Sandberg and Eddie Murray have been part of the coaching staffs. This year brought former White Sox pitcher, Rich Dotson and former Baltimore Orioles catcher, Floyd Rayford along with a few other former players. 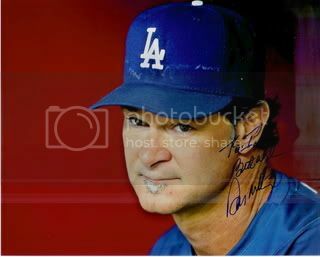 Most importantly the newly appointed Los Angeles Dodgers manager and New York Yankee legend, Don Mattingly served as the skipper for the Phoenix Desert Dogs. 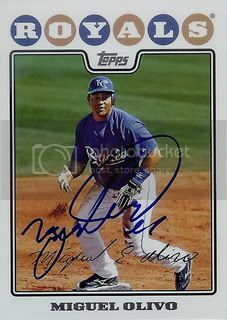 I've been able to get Mr. Mattingly's autograph once before but only on cards. This time we had him sign a photo for my son. Today is the final day of the 2010 Arizona Fall League. The championship game over at Scottsdale Stadium is underway. I honestly wasn't planning on going to the Fall League this year but about a week before the games started a season pass practically fell into my lap. Had a good time again this year. My dad, son, and I were able to go to a few games together too which is always great. 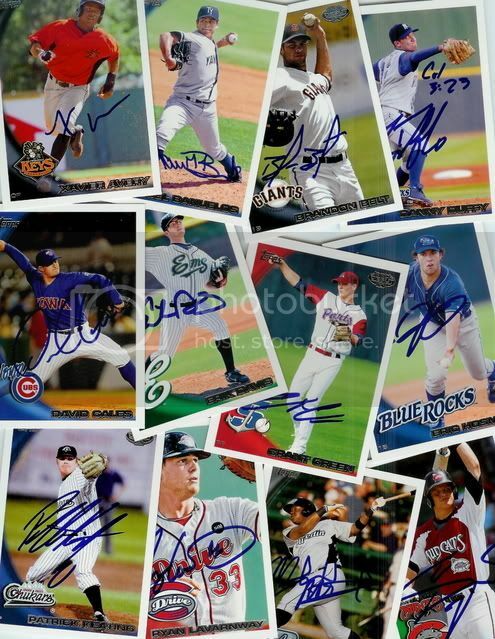 After a month and a half of games we ended up with a nice stack of new autographs. No, I wasn't able to get Bryce Harper. Honestly, I didn't try that hard. 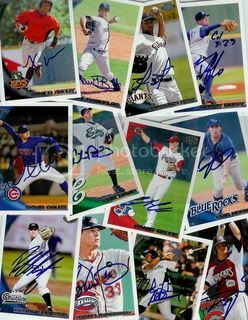 I was also able to get some of the 2010 Topps Pro Debut cards signed. This was the first time I've been able to get any of the cards from this set signed since it was released well after Spring Training ended. Of course we had cards from other sets that were signed too but I didn't scan those. All in all it was a great time. I'd like to thank each and every player who took the time to sign an autograph for us. Most everyone was extremely friendly which made this year even more enjoyable. Not sure if we'll be going again next year but I guess we have plenty of time to figure that out. 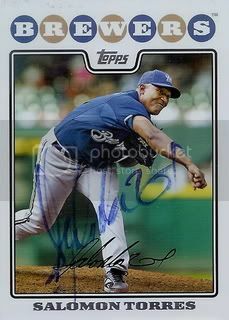 Everyone's favorite baseball autograph blogger, Zach from Autographed Cards, sent over a signed 08 Topps card of former Kansas City Royals backstop, Miguel Olivo. Really nice card with a really nice signature. Thanks, Zach! Finally picked up my fourth Silk Collection card. 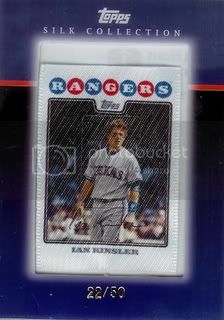 This one is of one of our favorite players, Ian Kinsler. These are kind of cool because they're different and numbered to 50. Ian was a big part of the Rangers run to the World Series. He's always been a nice guy. Hopefully we'll be able to do another post on this one soon after we get it signed. These jersey cards were bonuses from the 08 Topps blasters. I picked up three off eBay recently for less than a buck a piece. 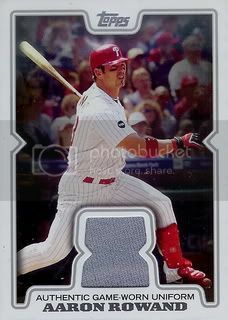 The third is of former Philadelphia Phillies and current San Francisco Giants outfielder, Aaron Rowand. Blog reader Dan sent over three signed 08 Topps cards for our set. 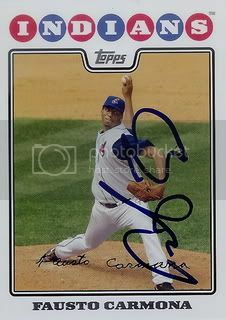 The final card is of 2010 All-Star, Fausto Carmonoa. All three are awesome additons to our set. Thanks, Dan! 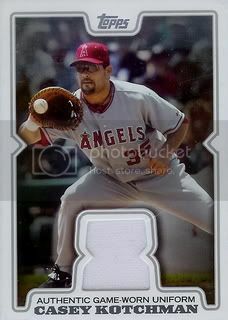 The second card is of former Los Angeles Angels first baseman, Casey Kotchman. Blog reader Dan sent over three signed 08 Topps cards for our set. Thanks, Dan! The second is of former Washington Nationals outfielder, Austin Kearns. 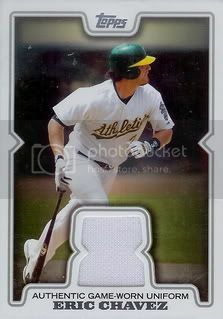 The first is of long-time Oakland A's third baseman, Eric Chavez. 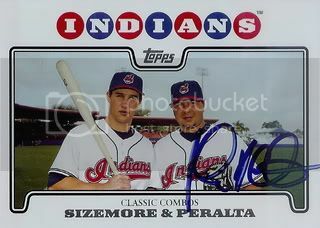 The first is a classic combos card signed by Jhonny Peralta. In my pursuit of trying to pick up more of the gold border parallel cards from the 08 Topps set, I've recently acquired these 9 cards. There are a few baseball card shops within a few miles of where I live but I rarely visit them. Maybe I'll stop by to pick up a storage box or some top loaders but I rarely find any actual cards to purchase. Usually their cases are full of overpriced certified autos or jersey cards. Stuff I might be interested in but not when I know I can pick it up for much cheaper on eBay. I guess what I'd like to see more of are 3200 ct boxes full of commons or semi-stars. On today's trip, I actually made a purchase. 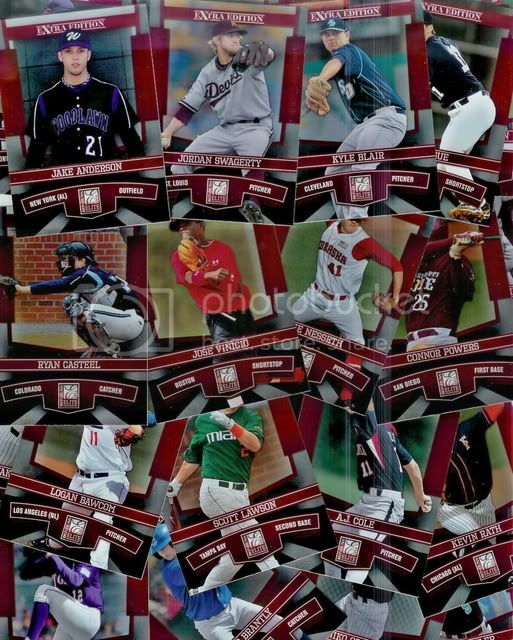 In the 5 for a $1 box I found a bunch of 2010 Donruss Elite Extra Edition singles. I could tell they had been picked over but I still managed to find a stack of Rangers, Padres, and Mariners to take home. Hopefully I'll be able to get a few of these signed during Spring Training next year. Brian "The Rabbi" Horwitz signed a card for our set. 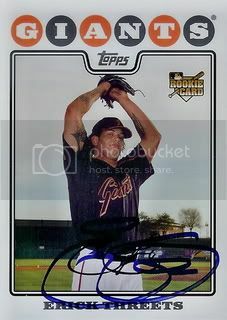 Brian made his major league debut on May 30, 2008 for the San Francisco Giants. It just so happens that today is his 28th birthday. Happy Birthday, Brian! 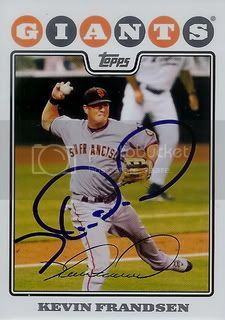 Former San Francisco Giants reliever, Erick Threets signed a card for our set. Erick ended the 2010 season with the Chicago White Sox organization. 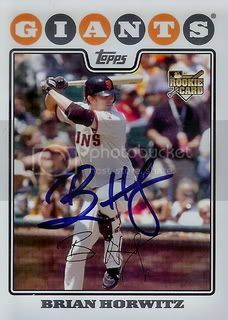 Former San Francisco Giants infielder, Brian Bocock signed a card for our set. Brian spent most of 2010 with the Lehigh Valley IronPigs but did see some time in the big leagues with the Philadelphia Phillies. 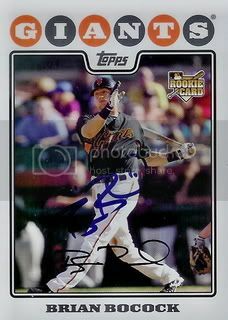 This card was signed the day that Kevin Frandsen on April 28th. 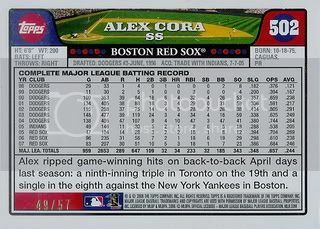 The same day he was designated for assignment by the Boston Red Sox. 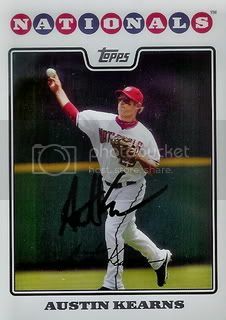 Kevin was with the Pawtucket Red Sox at the time and was claimed off waivers by Los Angeles Angels the very next day. 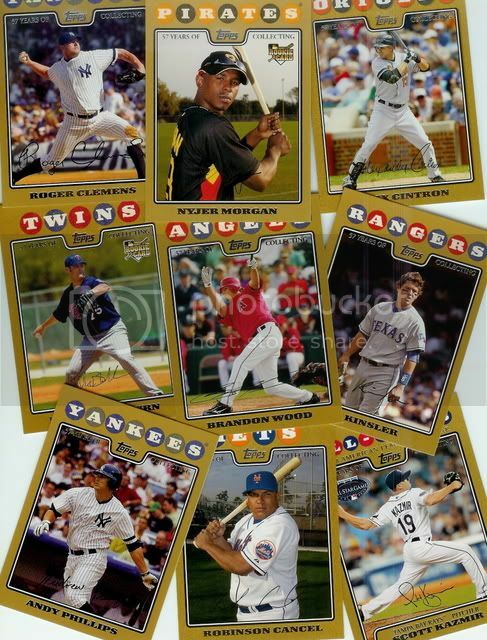 Thanks to eBay I was able to pick up a few of the 14 card 2008 Topps team sets. 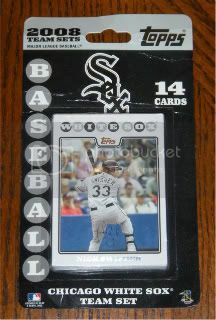 The lot I won included a Chicago White Sox set. 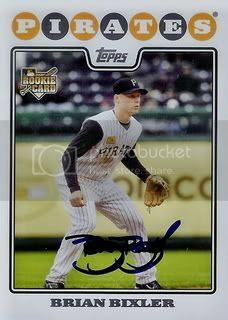 Former Pirates infielder, Brian Bixler signed a card for our set. Brian moved around a lot in 2010. To the best of my knowledge he is currently with the Washington Nationals organization.